Dear Readers: I welcome today Chris Sandrawich of the Jane Austen Society, Midlands, who has kindly provided me with the text of his essay written for Transactions 22 (2011), the JAS Midlands publication, on the subject of the group’s field trip to Worthing last October. Worthing has figured in the press recently, as well as on a number of Jane Austen blogs [you can view my post here: Library Passge in Worthing under Threat of Closure ], due to the attempt to close up the “Library Passage” that Jane Austen would have passed through during her stay in Worthing in 1805. [The hearing to prevent this closure has recently been heard by the City Council and all are awaiting their final decision … *] – it would indeed be a shame to shut down this site that has so recently come to light in relation to Austen and her unfinished novel Sanditon. 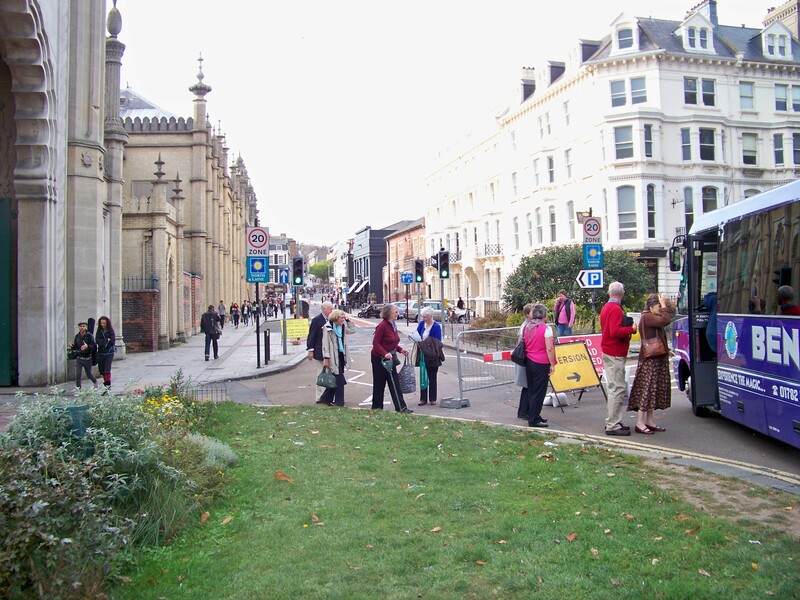 But here today is Chris’s take on Worthing and environs – this is long [but worth it!] – and please do comment or ask questions and I will have Chris respond. There was an additional connection with the area, apart from Sanditon, which was of interest to us concerning Jane and her family. Edward Austen was adopted as the legal heir of Thomas Knight II, his third cousin, and his wife Catherine Knatchbull, who were childless. Thomas Knight’s mother was Jane Monk who had lived at Buckingham Park in Old Shoreham, adjacent to Worthing. So, some of Edward’s inheritance could have been linked to, or indeed be made up of, local land and farms; but we discovered nothing new on our trip, although since returning I have learned from Janet Clarke (whom I should also thank for many suggestions and corrections to my article) that we could have seen and visited, had time allowed it, Buckingham House and the Monks’ Memorial, and some property in Southwick that had belonged to Jane Monk. Perhaps next time? Our journey included our usual bus, usual driver and usual picking-up points but not our usual cicerone and architect of this weekend’s sojourn in the deep south. An unlooked-for eye complaint had rendered our Dawn, “hors de combat” and we were left only with the framework and her notes. Either the notes were brilliant as a script, or Jen (Walton) and Jan (Barber) are better ad libbers than we may credit them with; but we managed without any mayhem. So a big thank-you, from all two dozen plus on the trip who loved their time in Worthing, goes along with our commiserations to Dawn Thomas. The journey south was much delayed by an unwanted opportunity to see how our taxes are used to keep Britain’s roads running smoothly. It’s unfortunate that the work carried out to achieve this long-term goal has the immediate reverse effect. In consequence, we were very late getting to Worthing and both the hotel and our after-dinner-speaker were very good in accommodating the time-shifts required. Jane may not have had an easy trip either, with eight in the party. It seems likely that they had two coaches and possibly different starting points and times, as Fanny’s letter dated 17th September 1805 lists only, “Papa, Mama, Aunts Cass & Jane” with herself, as setting off from Godmersham that day. It is not known if they were also incommoded with hat-boxes as Lizzy and Jane were with Lydia and Kitty in Pride & Prejudice. Fanny’s diary entries are very interesting and one snippet on 19th September mentions that Jane Austen won 17/- (seventeen shillings or eighty-five pence in today’s money) in a raffle, which may not sound a great deal. However, it would have been enough to buy twenty-four pounds weight in beef-steak. Now there is beef-steak and beef-steak, I suppose, and as an aid for comparison I noted that current prices from Tesco.com has beefsteak at £4.60 a pound. However, fillet steak is nearer £15 a pound. So Jane’s winnings have a purchasing power anywhere between £110 and £360 in October 2011 money. Jane, we are informed, was armed with “A Picture of Worthing” written by the Reverend John Evans (see Note 2) which was the first guide to Worthing. A pertinent comment by Louis Simond, (a well-to-do Frenchman, with an English wife, living and working in New York, and my source for English beef prices of the time) who toured the British Isles in 1810-11 (see Note 3) states that, “There is no place of any note in England which has not its printed guide”. The Reverend’s guide published in 1805 takes on more the appearance of a booklet as it includes notes on the surrounding towns too. I wonder what Jane thought when she read it. I certainly found one or two pieces of information contained within it very striking indeed. and that sums up the uses for half an anchor. I did ponder the possibility that “half an anchor” was a reference to a sum of money. An exhaustive trawl through the seas of leopards, nobles, crowns, monkeys, ponies, and groats along with many others left me better informed but alas no wiser. I could find no ‘anchors’ as an expression or name amongst coins, notes or sums of English money. Secondly, that enormous quantity of brandy is suggestive of smuggling if it seems to be both readily available in barrels and used as a tradable replacement for cash. As brandy comes from grapes it usually came to England at that time from France or Spain as they were nearest. However, bearing in mind the troubled times with constant war or political tensions then it seems that the entrepreneurship of smuggling was necessary to secure a steady flow. The Reverend as a ‘Parson’ seems to anticipate Kipling’s later poetic suggestion and that to be unsurprised by a large and ready supply of brandy was only natural for Parsons. A quite astonishing statement appears on page 17 of this guide about the notable Mr Luther who built Warwick House (“Trafalgar House” in Sanditon), the principal house in the Town, which stood opposite to the Colonnade Library (and at that time (1805) was owned by Edward Ogle). Mr Luther it seems lost at one throw of the dice one hundred thousand pounds. If we take Mr Darcy’s (a reportedly rich man’s) income of £10,000 pa from Pride & Prejudice as a comparison then at 4% interest it would be equivalent to an investment in fixed-interest securities of £250,000 at that time; and so Mr Luther was rich enough, or foolish enough – take your pick – to venture 40% of a Mr Darcy-size fortune on one throw of the dice. Also, if we calculate a “beef-steak price index” (adjusting 9d (nine-pence in old money) up to the mid-point current price for beefsteak of £9.80 currently) applied to Mr Luther’s £100,000, it zooms up to a quite remarkable £26,133,000 to the nearest grand. Of course picking the price of only one basic foodstuff does not give a sound basis for comparison that would be able to satisfy economists and mathematicians. I share George Bernard Shaw’s views who claimed, “If all economists were laid end to end, they would not reach a conclusion”, and so I’m giving a comparison for fun, rather than on a scientific basis. It does make reports of Mr Wickham’s gaming in Brighton look singularly tame! However, it is reported that Mr Luther, just like Wickham, gambled with money he did not have, and he only settled half of his debt. Also, on the subject of money it seems ‘Bathing’ was not cheap. It cost adults one shilling and children six-pence to use the Bathing Machines for each and every dip, delicious (as Fanny described it) or otherwise. You can find out more at www.sussex.greatbritishlife.co.uk., or by reading the Jane Austen Society Report for 2010. It was of course very likely that Edward Ogle inspired the character, Mr Parker who owned Trafalgar House. Chris Hare, a local historian, using a few slides gave a most interesting verbal tour of Worthing’s origins and history, paying particular attention to the time of Jane Austen’s visit. These notes are an amalgam of what I heard, or thought I heard, and what I thought after I heard it! A Royal visit in 1798 ‘to take the air’ put Worthing ‘on the map’ by popularising a stay there for health reasons. Princess Amelia, the youngest surviving child and favourite daughter of George III, stayed at Montague Place built c 1780. Provided for the Princess’s protection, there were over one hundred soldiers from the Derbyshire Militia camped locally, and a sloop, the Fly, cruised just off shore. Worthing’s developers were determined to make Worthing everything that Brighton (eleven miles away to the east) was not and this is what principally attracted Princess Amelia, or more probably her father. 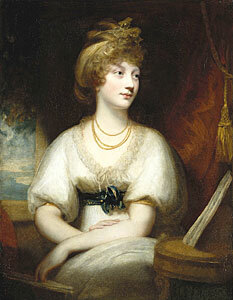 Jane, and the Austen family, would have received news of the Trafalgar action and Nelson’s victory whilst in Worthing. This would have been of especial interest as two of Jane’s brothers, Francis and Charles, who together with Cassandra and Jane made up the younger half of the Austen children, at that time were Captains in the Royal Navy and Francis was actually with Nelson’s fleet. Sent for water and provisions Francis missed the Trafalgar action but it would have been some time before news in the combination of newspapers and private letters told his friends and relatives that he was safe, and there were very many killed and injured from all nations involved. This decisive action was ‘very big news’ at the time and must have been much talked about. By including a Trafalgar House in Sanditon it is probable that Jane was explicitly making the connection. Both Jane’s brothers eventually rose to the rank of Admiral. Sir Francis Austen became Admiral of the Fleet, the most senior position in the Royal Navy, and he was well into his eighties when this final promotion came. So there is hope for us all, yet! 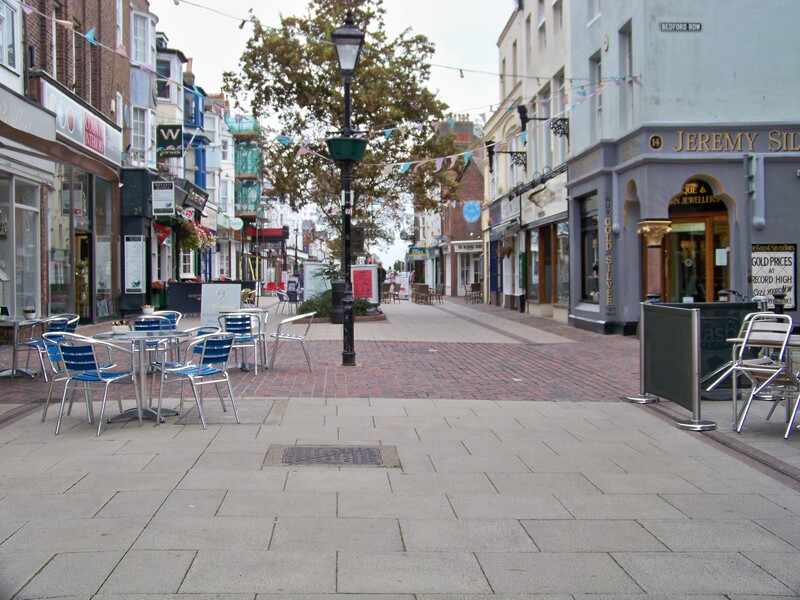 Bedford Row, a street typical of Worthing’s new developments, was built 1803–04 and had large bow-fronted windows to capture more light. The buildings were four storeys high, and would have included basements as well as attics in addition. W H Hudson, author and naturalist, stayed there, at ‘Huntingdon House’ No 8 Bedford Row. Around the time of Jane’s visit the Chatsworth Hotel (our base for the weekend), which was initially called the Steyne Hotel (Steyne is an Anglo-Saxon word meaning “stony place”), was being built, or planned by George Parsons, as it opened in 1807, and its ballroom was used as the Assembly Rooms. 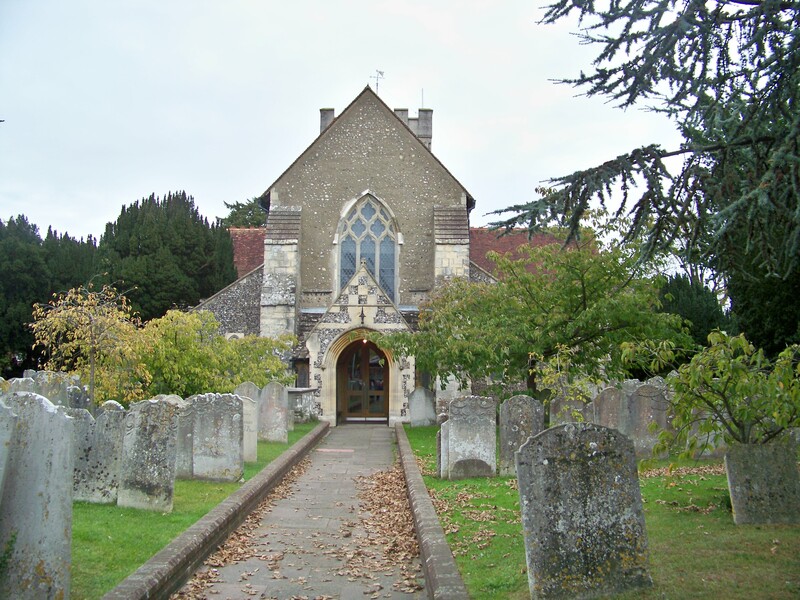 St Mary’s Church, Broadwater, which Jane would have passed on the way into Worthing, was the principal church in the neighbourhood and Jane and family would certainly have gone there for worship. Highdown Hill is close to Worthing’s coast and a windmill was sited there to make the most of the coastal winds. It also served a certain Mr Miller, who has a famous tomb we did not manage to visit, and was an infamous local ‘hero’, as a base for a signalling system to smugglers. 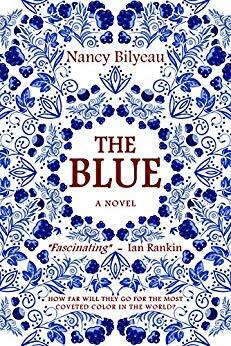 In Jane Austen’s time the south coast was awash with smugglers and if A Smuggler’s Song by Kipling, “Brandy for the Parson, ‘Baccy for the Clerk;” is taken as gospel pretty much everyone was involved one way or another. This windmill at over 200 feet on high ground near the sea could signal to smugglers’ ships over seventeen miles out; even further, if a ship used its own crow’s nest. Such traffic could be lurking well over the horizon in mid-channel safely waiting for the signal that the Excise men posted along the shore had gone elsewhere, and that it was safe to come in with ‘the goods’. A man of average height standing on the sands can only see a boat if it is less than three to four miles out at sea. 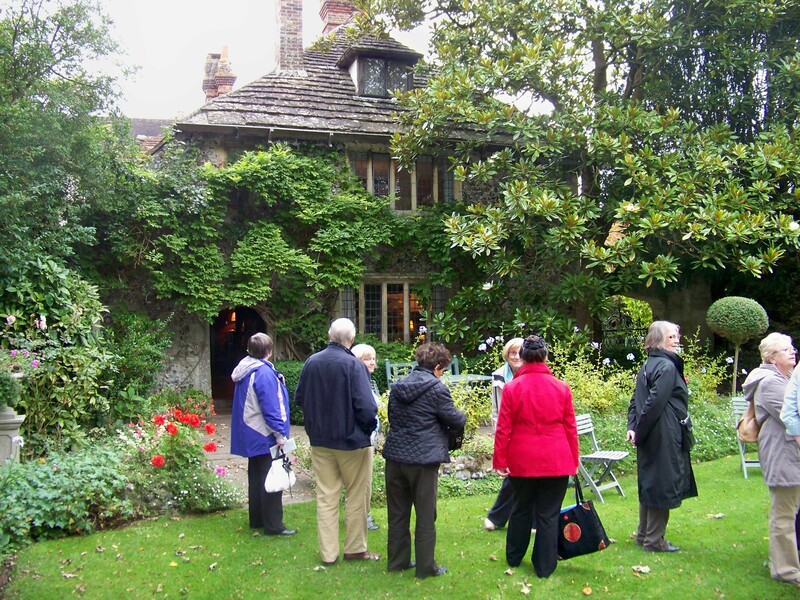 Fig Trees were a tourist attraction in Jane Austen’s time. There are still fig gardens, in South Street Tarring, open to the public on one day a year (see Note 5). However, the large fig gardens which Jane may have visited dating from about 1745 were largely destroyed in the late 20th Century to make way for development. 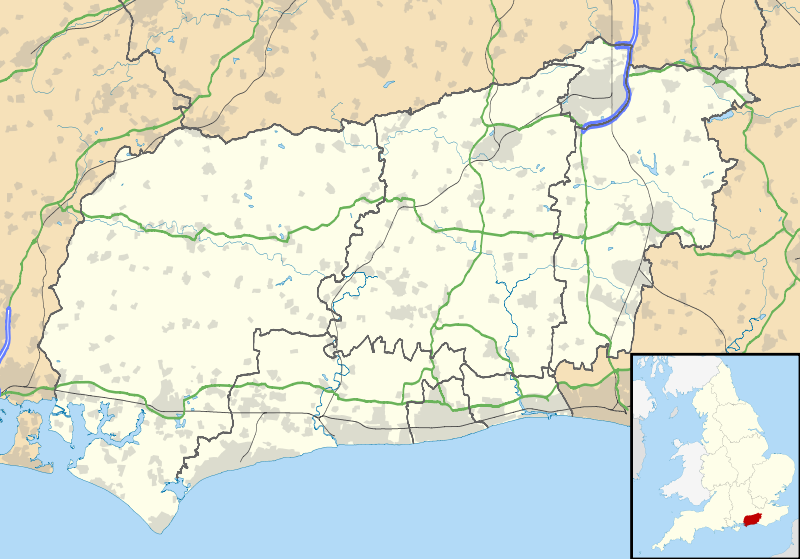 West Tarring is a suburb of Worthing, and is a very old village, dating back to Saxon times (earliest ref. around 939AD). It was one of the most important trading towns in this area, and its historical importance is emphasised by having one of the Archbishop of Canterbury’s Palaces there. Horace Smith, poet and friend of Shelley, arrived in 1822, so he missed Jane by a distance, in a “Newton Patent Safety Coach”, and I am fascinated to find out what it looked like. Coaches of the time were notoriously top-heavy and prone to overturn. An “overturned carriage” travelling along badly surfaced roads features in the opening paragraphs of Sanditon. 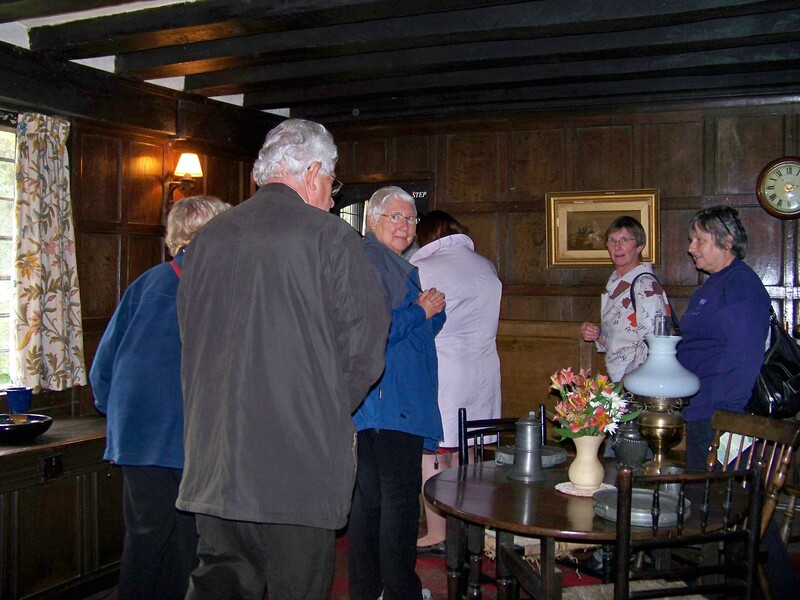 Janet Clarke, (partly obscured in red towards the right in the photo above) ably assisted by Sue Dawes, took our party on a guided tour of Worthing armed with a lens focused on 1805 and Jane Austen. The picture below shows Warwick Street and Stanford Cottage (known as Stanford’s Cottage in Jane’s time) is a few short strides down an alleyway just off it. Janet pointed out which buildings stood in 1805 and their function at that time. Worthing is compact, its centre easily fitting into a square mile, and contains many Georgian and Regency architectural gems; such as the Colonnade built by Edward Ogle. 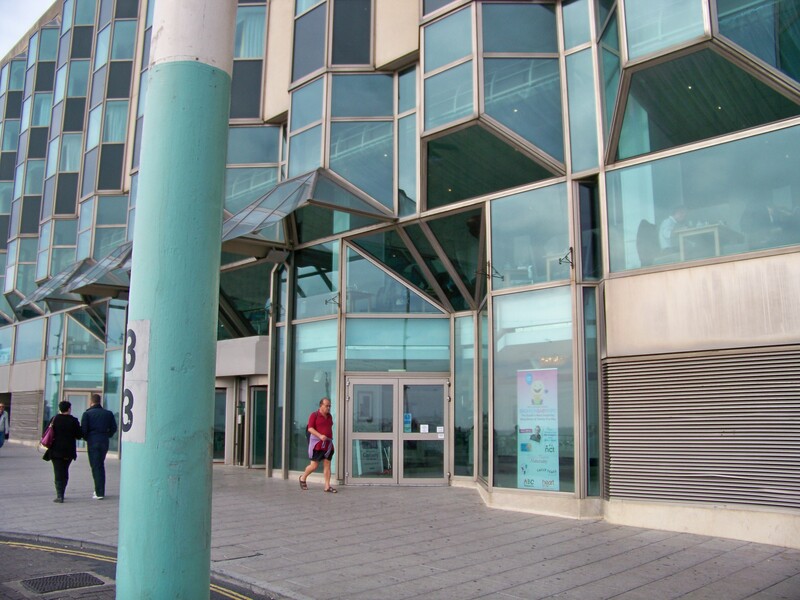 Changes of use for buildings can take bizarre twists and the remains of the Marine Library, which would have been a lively meeting place in Jane’s day, are now a single storey building and part of the bus station. “Libraries” to Jane and her circle did not only provide reading material, books, magazines, journals, newspapers and so on, but were alive with shops, gossip, cards (including gambling) as well as musical entertainment. 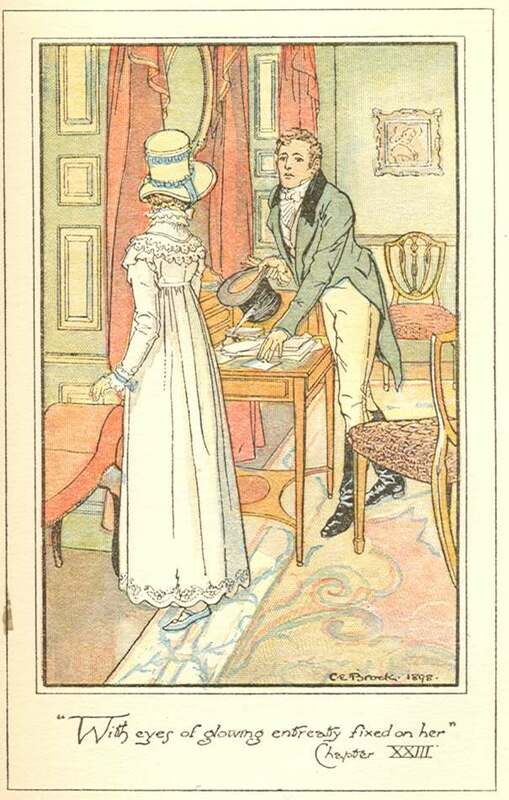 This ‘discovery’ has helped me understand why in Chapter 42 of Pride and Prejudice Lydia is reported as having been to a library – the last place (as it has serious books) I would previously have expected her to have any interest in – and why she had seen some beautiful ornaments which made her quite wild! In Jane’s time many houses and buildings stood apart with fields, lawns and grazing sheep and cows in between. It is hard to visualise this in the crowded streets. Janet, ever helpful, was able to add a great deal to our understanding of Jane Austen’s Worthing. There are many buildings still standing which Jane would have seen, and for many of them change has occurred. The originals would have had a distinctive ‘creamy yellow’ hue as the bricks made locally from the blue clay described in the Reverend Evan’s guide when fired in the local kilns produced this colour. Regrettably almost all of the buildings have been “improved” with paint, or plaster or rendering over the last two hundred or so years. The Steyne Terrace (where we stayed) although completed after Jane’s stay still has this creamy yellow hue. Montague Place No’s. 2-6 are believed to have been used by Princess Amelia and her entourage, although the Prince Regent on his short visit didn’t think the location grand enough for his sister. The Brighton Pavilion leaves nobody in any doubt as to the Prince’s idea of what is ‘grand enough’ for Royalty. 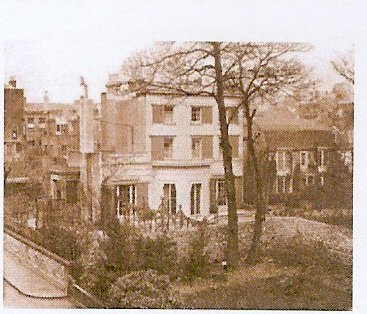 Great Terrace is one of Worthing’s first terraces built facing the sea, and designed as lodging houses for visitors. Jane Austen must surely have had this place in mind for the ‘Short Terrace’ in Sanditon where the academy party stayed. It becomes even more compelling if we compare the descriptions by Reverend Evans of the Terraces in Worthing with Jane’s in Sanditon. Also, anyone looking at the Great Terrace and its corner house can easily imagine Miss Diana Parker settling her new friends, the Miss Beauforts, into it even to the rearrangement of blinds and flowerpots on the upstairs balcony. The present Great Terrace has both a balcony and flowerpots, there for all to witness. The same flowerpots and with Mrs Mary Parker’s cuttings we wondered? With regard to the vexed question (at least with me as I was hoping as in the Merchant of Venice that,”truth will come to light . . . at the length truth will out” and I do hope that I am doing rather better than Sir Edward Denham at nailing quotations) of where exactly Princess Amelia stayed, I wrote to the Royal Archives but unhappily they have no information which identifies whereabouts in Worthing she stayed. All Princess Amelia’s letters are simply headed “Worthing”, and so I have nothing new to add, as I had hoped to, with the conflicting information set out below. Janet Clarke mentioned more information than appears in her own guide which suggests that she stayed both at Bedford House and Montague Place. I had recourse to my dictionary to look up what ‘feu-de-joie’ means and found it to be a military term meaning: “a salute of musketry fired successively by each man in turn along a line and back”, literally: ‘fire of joy’. Of course, you knew that already. However, as you may have noticed previously, I do have occasional difficulty in fully comprehending other people’s descriptions of things; and this definition leaves me perplexed. I’ve never fired a 200-year-old musket, but I understand that it takes time to reload the musket after firing. A musket ball has to be rammed down the barrel and the firing chamber recharged with gunpowder. So if the firing goes from left to right and then immediately from right to left, as the definition implies, then there would be an inconvenient pause and firing would no longer be successive. If the firing sequence was left to right and then left to right again (to give all time to reload) then firing would be continuous but it would no longer fit the definition given. I’m bemused. Janet also gave us all copies of an excellent local guide (see Note 6), “Jane Austen’s Worthing” Janet designed this useful leaflet but had it published by Verité CM Ltd. Many pictures of sites in Worthing are available on http://www.westsussexpast.org/pictures/ . It takes some imagination, as so much other construction and demolition has taken place over the last century. It helps if you are also told that the view is from the front (the Pizza Express) and from the back (the 1907 photograph). You may, however, find that this does not help at all. 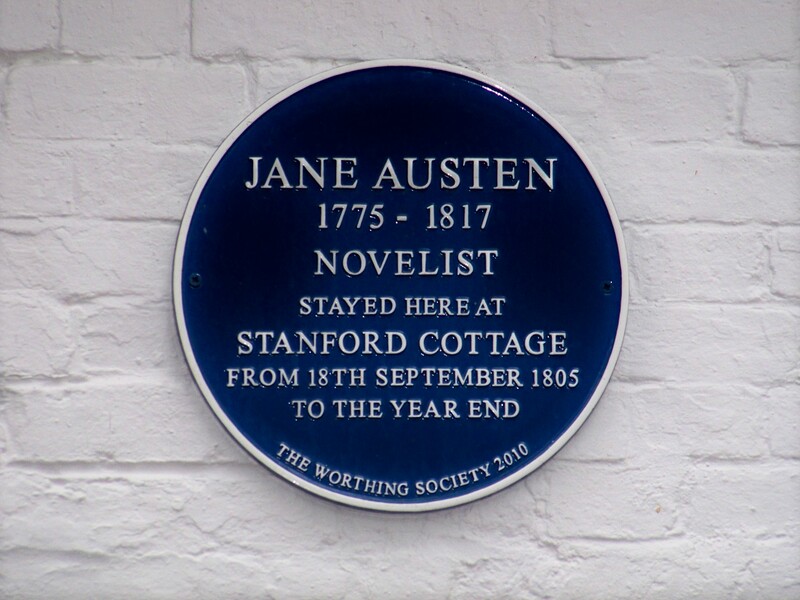 Worthing, prompted by Janet Clarke, have marked Jane’s stay at Stanford Cottage with a blue plaque on the building giving salient details, and you can just see it above the window to the right of the tree in the photo above. It is shown here with more detail. The Pizza Express has three pictures (or cartoons, as Gill Marchment suggested) inside on the first (second for any American readers) floor with quotations and it takes a feat of one’s memory to accurately place them all. I have shown them in full below and the answers to who said them and where they appear are listed at the end of this article. If you can get any one of them you are doing well and if you get all three (without looking) then can I be in your team for any Jane Austen quiz please? Unfortunately, there are no prizes except self-satisfaction. So, what of Worthing the place? It is clear that the town is struggling through the doldrums given the number of estate agents’ signs over empty shop fronts, but it is pleasant enough to stroll through, and you can always find something of interest. For example, the history of English is varied and fascinating and along with so many new words we have some that are very old, and still in use. Worthing has an interesting old Sussex dialect word, twitten (see Note 7), said to be a corruption of ‘betwixt and between’ although the on-line Oxford Dictionary suggests it is an early 19th Century word (unbelievably!) 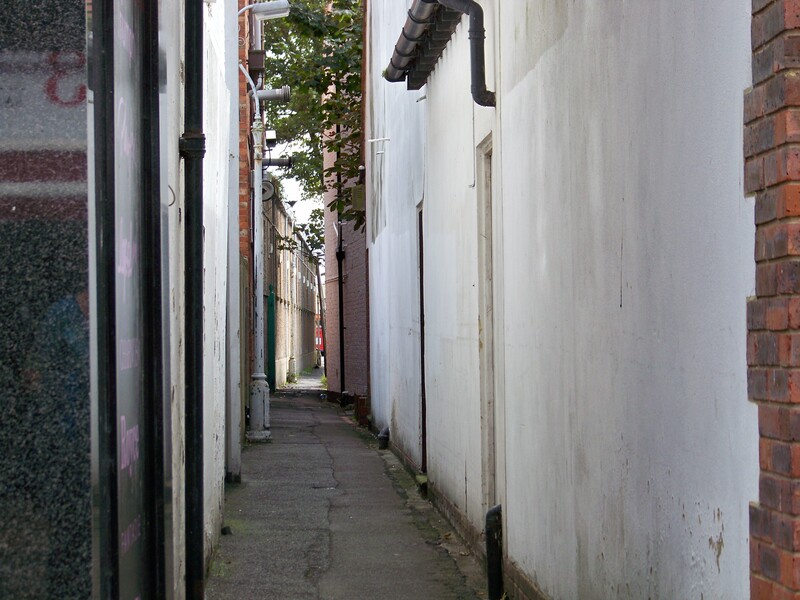 perhaps related to Low German twiete ‘alley, lane’, used for a path or an alleyway. It is still in common use in both East and West Sussex, and oddly enough in Hampstead Garden Suburb. As tussen, steggen or steeg in the Netherlands has a similar meaning it would be all too easy to assume that source as the derivation. Such pathways between buildings have other names around the world, but elsewhere in England twittens are called variously, twitchells (north-west Essex, east Hertfordshire and Nottingham), chares (north-east England, especially Newcastle), ginnels – which can also be spelt jennels or gennels – (Manchester, Oldham, Sheffield and south Yorkshire), opes (Plymouth), jiggers or entry (Liverpool), gitties or jitty (Derbyshire and Leicestershire), snickleways or snicket (York), shuts (Shropshire) and are called vennels in Scotland; but it is not known what our Jane called them, but it is very likely she may have called the “Library Passage” [shown below] a twitten as Jane used it with her family to get from Stanford Cottage to Stafford’s Library, as well as the sea front. This fine example of a Worthing twitten is just off Warwick Street, and only a lady’s baseball (see Northanger Abbey) throw from Stanford Cottage. Janet Clarke informed me that this twitten is currently under threat from a bus company, Stagecoach, who owns the land and wish to “stop it up” permanently. [link to post] This twitten now runs from Warwick Street into the bus depot. Of course, anything being an ancient historic “right of way” for the ordinary people of England and Wales does not put off Companies from making such proposals whenever it suits the moment. Look at it again, while you have the chance, and if this twitten through your half-closed eyes and with some imagination resembles a footpath through dense woodland; then, there you have it. A short bus-ride from the hotel took us all along to St Mary’s Church, Broadwater, shown just below. The Reverend Evans’ guide describes it as a pleasant one-mile walk across the fields in fine weather but too far for the old and infirm. 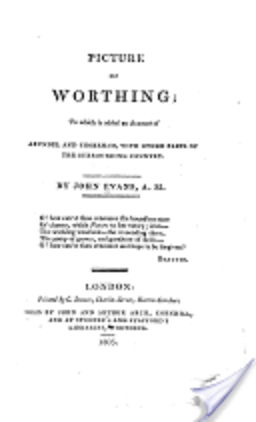 Therefore, he supported the proposal to build, by public subscription, a Chapel of Ease in Worthing. Jane and her family are bound to have worshipped at St Mary’s, as there was no other suitable church in Worthing at that time. Most of Worthing’s current churches, just like Brighton’s, are non-conformist. Worship has taken place in this beautiful Broadwater church for over 800 years and during restoration work carried out in 1939 a Saxon doorway in the south wall of the chancel was uncovered. A Saxon church on this site is mentioned in the Domesday Book. We were met very warmly by Christine Colthurst and Helen Craft, Parish Wardens, who gave us a tour of the church and posted a welcoming message on the LED screens in the church. We were also addressed by Councillor Ann Barlow, Mayor of Worthing, who is also a Reader at St Mary’s Church, and she explained the developments which have transformed the inside of this old church with the massive funding required being raised locally from parishioners. The many LED screens giving a continous cycle of information and images on PowerPoint about the church gave a very modern feel to the message of Christianity and we were left wondering, as we often do, what our Jane would make of it all. I gained a few pounds from the plates of biscuits, flapjacks and other mouth-watering dainties that went with the coffee and tea on offer. These lovely ladies can bake for England! (1) I had noticed from a Worthing Street Map that many English novellists and poets had been honoured by having thoroughfares named after them. We have Shakespeare, Browning, Longfellow (you just cannot keep Americans out), Chaucer, Cowper, Shelley (stayed at 23 Warwick Street), Byron (visited Worthing in 1806), Wordsworth and Milton all with roads named after them. 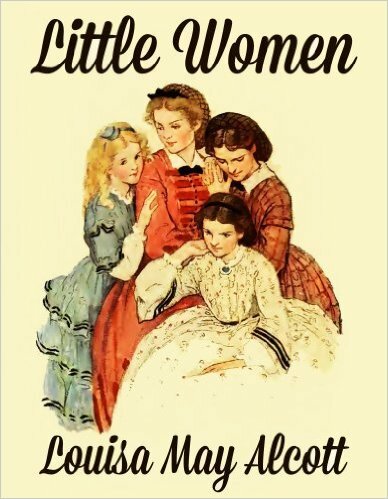 I pointed out that they were all men and the time was ripe for Ladies to have a turn starting with Jane Austen, should any suitable development offer that opportunity. that had been discovered amongst Jane Austen’s papers. St Nicholas’ Church Steventon, where Jane Austen worshipped, has an extract from one of Jane’s other prayers on display. Both her father and elder brother James were of course Rectors at St Nicholas. I even offered to pay the costs should my Society decline to foot the bill! At this early stage both ideas have been merely noted. 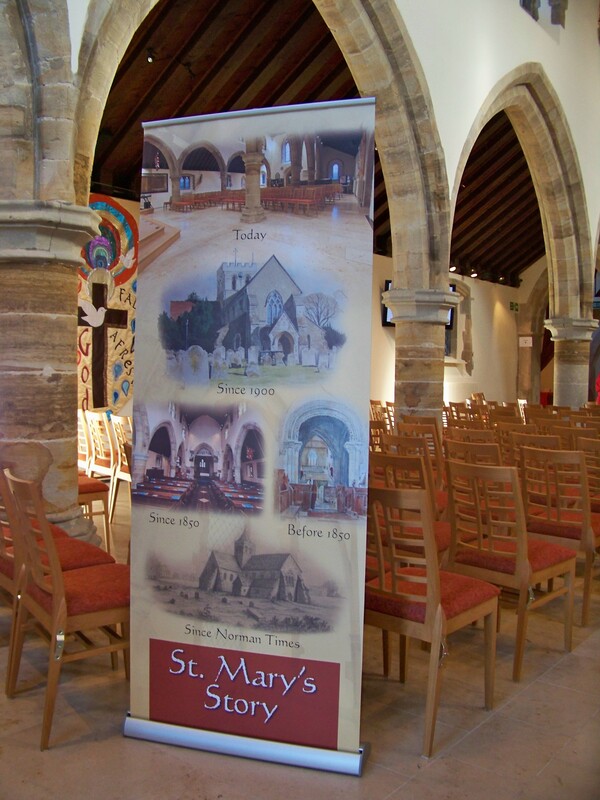 St Mary’s, again? It can only be the popularity of the name. Any other connection with our previous visit escapes me. 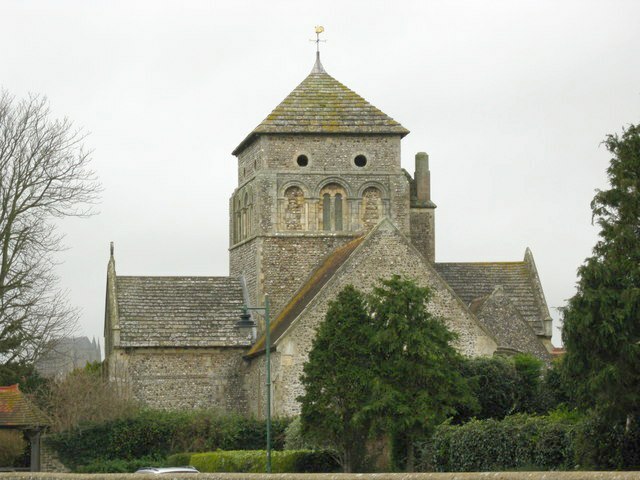 Bramber, set in the West Sussex Downlands, is four or five miles inland to the north of Shoreham-by-Sea, which itself acts as a buffer between Worthing and Brighton. Ribbon development in England along connecting roads does tend to blur the boundaries between places. Just one more change since Jane Austen’s time that we need to take into account, as progress remorselessly grinds on. On the way there in the coach we travelled along the Old Shoreham Road and passed ‘The Red Lion Inn’ which, as a Coaching Inn, stood in 1805, and who can say if Jane’s party went in for refreshment. We didn’t have time either! We saw close by a beautifully preserved single-lane wooden bridge (no longer used for vehicles) which Jane and her party would have certainly crossed by coach, and paid a toll, in getting over the River Adur on their way to Worthing. There was no other quick way. 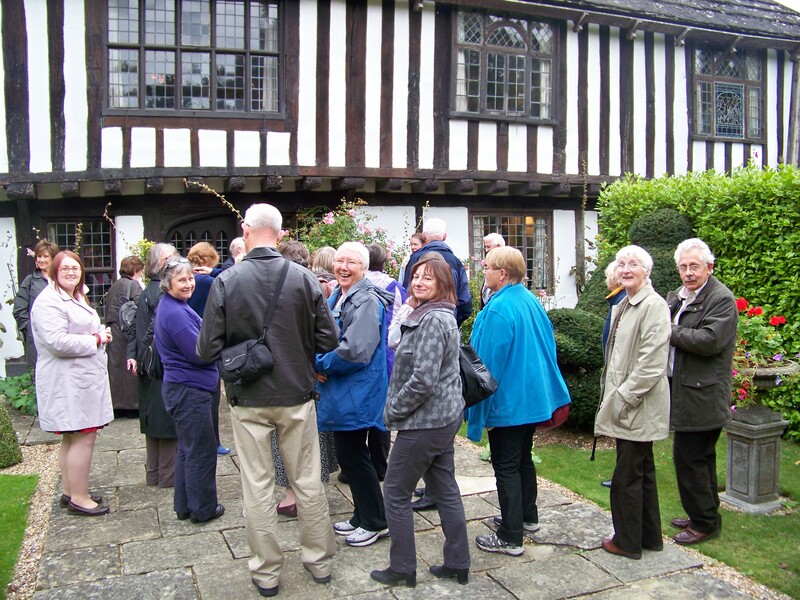 Our party was welcomed by the owners: Peter Thorogood, author and composer, and Roger Linton, curator and designer, who stressed that St Mary’s was still a lived-in home, and has been continuously for over 600 years. We were all given leaflets (Louis Simond is again proved correct about leaflets), that confirms their website as being www.stmarysbramber.co.uk and it is well worth a visit. St Mary’s is a fine example of a late 15th Century timber-framed house, and is a Grade I listed building. The photo [above] is of some of our troupe going in. The land was originally owned by Lord Bramber; and his wife had connections with Hay-on-Wye. 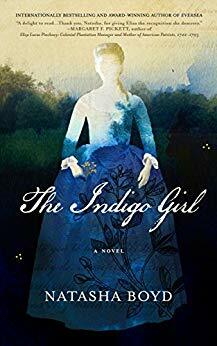 Barbara Erskine has written a book about The Lady of Hay. You can find out more about the original Lady herself and how Lady Bramber built the castle at Hay-on-Wye in a single night. Isn’t myth wonderful? You may wish to visit Wikipedia to find out more by going to http://en.wikipedia.org/wiki/Maud_de_Braose. There are mysteries literally buried at St Mary’s as, because of flooding, some cellars previously giving access to rooms and tunnels under the house are now sealed off. Those who knew what these rooms were used for and just where those tunnels might lead to, perhaps to the church of St Botolph’s, have now taken their secrets to the grave. There was so much information available to absorb I could not write fast enough. The buildings were owned at one time by the Knights Templar, and became a Benedictine Monks’ Inn at the time St Mary’s was a priory. 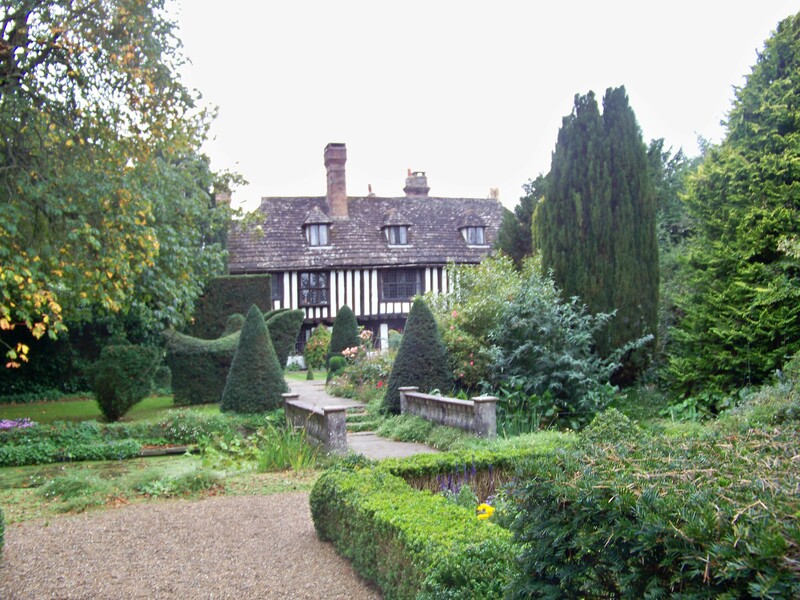 The Inn was often used as a stopover by pilgrim travellers coming north through France on their journey to St Thomas à Becket’s tomb in Canterbury. After St Mary’s, pilgrims would have travelled on to Lewes, and then Eastbourne and Hastings, before journeying north over the downs towards Ashford and then Canterbury. One wonders if Jane Austen coming south-west from Godmersham (between Ashford and Canterbury) would have shared much of the same roads, at least as far as Hastings. According to her niece Fanny, we know that they stopped at Battle (or Battel as she spelt it) near Hastings, obviously! As the total journey was over eighty miles, and at winter speeds and over many undulations, they could have made only six miles an hour, at best, most of the way. At Battle they could not find lodgings and so diverted north to Horsebridge where they slept overnight. Then they went on to Brighton and Worthing. I snapped this picture of part of our group, in situ in the Warden’s Room, before my attention was drawn to a notice right behind me requesting we refrain from using the camera. Too late by then! We are in the room with a “Dragon Beam”, (out of sight above my head), which means diagonal, and judging by size it must be bearing quite a lot of the structural forces. The room we are seen going into was the reception room, and was once featured in an episode of Dr Who. The BBC carpenters made a model of the doorframe and door leading to the outside and gardens, presumably of something like balsa wood as in the episode the actors in a tussle crash their way through it. Peter Thorogood said they still had the wrecked door left to them up in the attic, after the carpenters ‘made good’ the original doorway. There were no parties expressing any interest in viewing the remains, but he did not seem too disappointed! Peter was a mine of information. The sea and ships came right up to St Mary’s, which was on a broad tidal estuary, 800 years ago, and he complained that their cellars still flood from time to time, as ‘tongue-in-cheek’ he claimed St Mary’s is ‘built on water’ and the surrounding land at that time was mainly salt marshes and oyster beds. There was a 13th Century ‘stone’ bridge close by and tolls were paid for crossing. Peter claimed the bridge was made from pressed winkles. I assume the builders ate the poor winkles first, although from the winkles’ point of view that is scant consolation. The coastal drift meant that Bramber and Rye just like Hythe (one of the original Cinque Ports) as with many other places on the Kent coast appeared to gradually move inland. The North Atlantic drift bringing warm water and air from the Caribbean up towards the Arctic and so keeping Murmansk inside the Arctic circle ice-free all year around necessarily causes colder water to come south into the North Sea (German Ocean in Jane’s day). The only easy way out for these billions of gallons is via the English Channel and back into the North Atlantic. People in Worthing say that the east to west (left to right as they view it) flow makes the waters at times look more like a river going past than the sea. 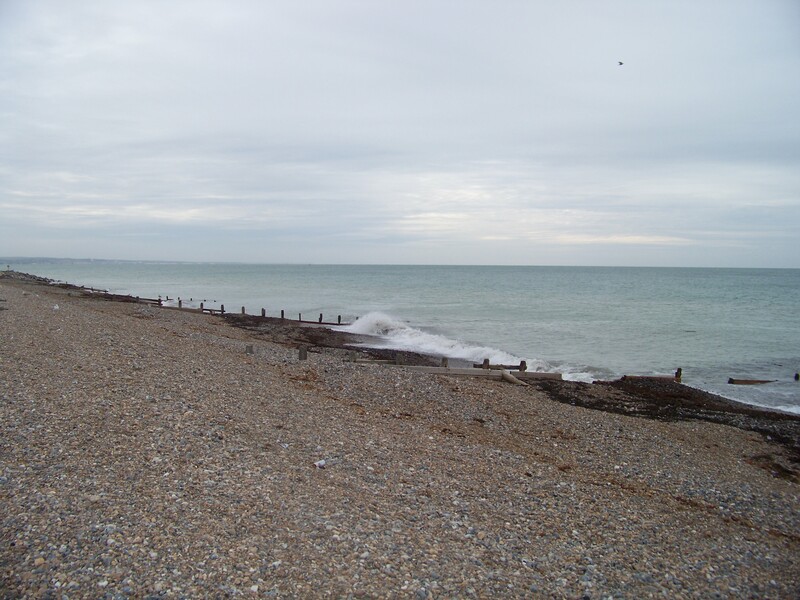 It may leave lots of deposits, such as shingle, but in other places it also carries a lot of sand away, despite or because of the groynes, leaving now only pebbles and shingle to walk on. According to Fanny’s diary, she and Aunt Jane walked along ‘the sands’ on Jane’s first evening in Worthing. I suspected poetic licence, because I saw only shingle. We were told that at low tide there is still sand out there, but they would say that, wouldn’t they. St Mary’s has engraved wood panelling and marquetry everywhere. It would take all day just to view the walls properly. There is an octagonal dining room containing over 80 English costume dolls from different centuries. They also have an Elizabethan trompe l’oeil Painted Room, and a “secret” Victorian music room arranged in a way that Jane and Cassandra could have been well used to. Peter mentioned that the house has other literary connections. Oscar Wilde’s play, The Importance of Being Earnest, which was written in Worthing in 1894, has many names in it associated with St Mary’s, such as one famous owner Hon Algernon Bourke and his wife Gwendolen. ‘Bracknell’, “A handbag!” also figures as Algernon’s cousin Lady Queensberry lived at Bracknell. Her husband, The Marquis of Queensberry and their son, Lord Alfred Douglas, also loom large in Oscar Wilde’s history, but that as they say, is another story. There is also a connection with Sherlock Holmes and The Musgrave Ritual, as St Mary’s was once owned by the wealthy socialite Alfred Musgrave who, it is said, was the inspiration for Sir Arthur Conan Doyle’s novel, which involves a body found in the cellar. They also fancy that Charles II fleeing to France stayed at St Mary’s, and they have named the King’s Room in his honour. They have five acres of stunningly beautiful gardens which includes in the ‘Terrace Garden’ a Ginkgo Biloba ‘living fossil’ tree, which is the world’s oldest species of deciduous tree, some amusing animal topiary, and a Victorian ‘Secret’ Garden that has a massive 140-foot fruit wall with original heated pineapple pits and store-house. As if this was not enough, they also have an unusual circular English Poetry Garden and Rural Museum, along with a Jubilee Rose garden. It was difficult to take it all in. Geoff Mead, a local historian, using a few slides gave a most interesting talk on Brighton’s origins and history and linked information pertinent to the time of Jane Austen’s visit. These notes are also an amalgam of what I heard, or thought I heard, and what I thought after I heard it! Brighton had a population of 25,000, about ten times the size of Worthing. The oldest building dates from 1650. It was always a marine port and having no sand-bars or rocks presented the local boats with easy access for trade. West Brighton housed the rich with the poor to the east. However, the East had a common and the only place to ‘promenade’ in style and the rich and famous did so with three paid musicians in place playing gentle airs. It was vitally important in the society of the time to both “see” and to “be seen” and to be in the height of fashion doing it. 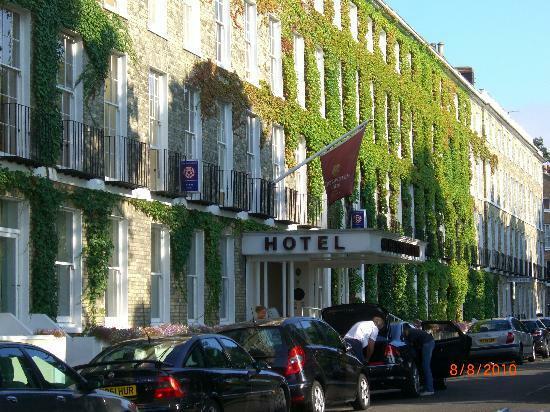 In the Prince Regent’s time Brighton became the biggest resort in Europe, but he only visited four times when King. The original town was surrounded by five large fields called, oddly enough, ‘lanes’, and to the west they were larger and so housed the elegant squares. 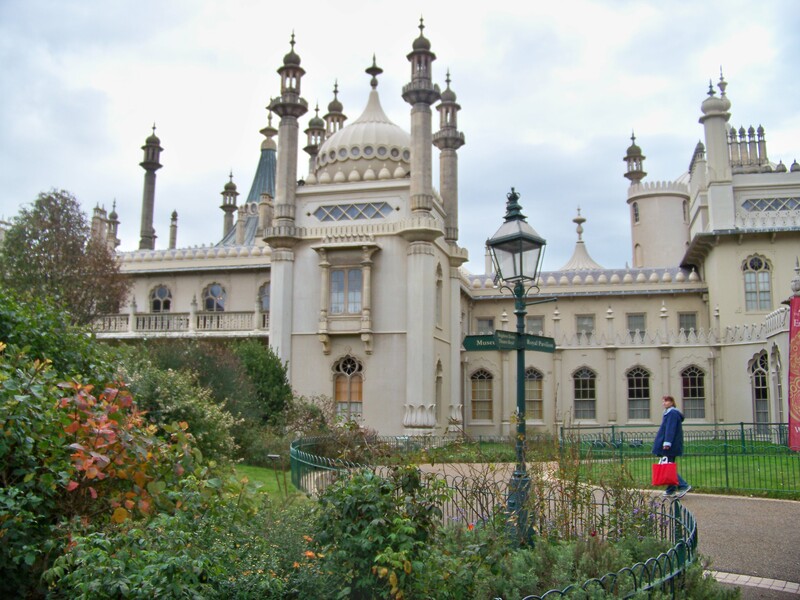 Marine Pavilion was redeveloped by the Prince to become the Royal Pavilion. London with its pollution, smoke, smog and filth, and its teeming multitude (Louis Simond’s Journal, a mine of information, quotes the 1802 census as finding there were 9,706,378 people in England and Wales, with 899,459 living in London) were only 50 miles away. As the idea of taking the sea air for health gathered pace then Brighton boomed, most of it happening 1811-21. This rapid growth produced large numbers of jobs, and needed more growth to accommodate the builders first, then servants second, with 95% of the seasonally fluctuating population being in rented accommodation. Local flint and countless tons of cobbles from the beach were used in construction. There are also fish in the sea and lamb on the downs, as ready food sources. Typical south coast boats were called “hog boats” or “hoggies” as they were short and fat and had flat bottoms so they could run on to the shingle beach unharmed and float off on the next tide. Although great for loading/unloading they wallowed in rough seas. Sailing in choppy waters must have required careful balancing of both cargo and crew. Up-ended damaged boats along the seashore housing the poor were a common sight. There are 19th Century prints of them in Brighton. Dickens describes one such in David Copperfield with Peggotty, Little Em’ly, Ham and Mrs Gummidge all living in an upturned boat on the beaches in Great Yarmouth. These boats are thought to be the origin of “net shops” on the beach at Hastings. Not to be confused with NetShops the on-line retail store based in Nebraska. How language has changed since Jane’s day! West Street’s reputation suffered at Geoff’s hands when he described it as having, “every species of immorality encamped” and the town of Brighton was notorious for crime as well. 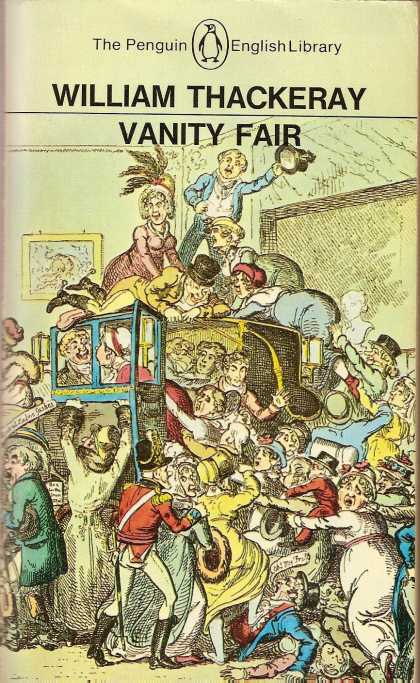 Geoff mentioned a quote from Jane Austen which runs, “Here I am once more in this scene of dissipation and vice, and I begin already to find my morals corrupted.” which she wrote from Cork Street (London) in August 1796 to Cassandra. 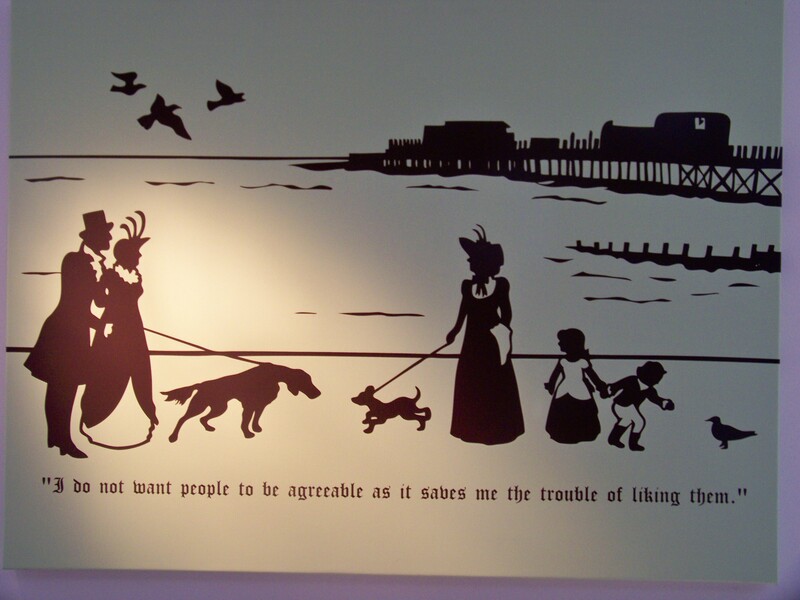 Geoff seemed to suggest that Jane Austen could have said much the same, and possibly more, about Brighton. She did not record it if she did, other than through Mr Bennett’s aversion to Brighton and Lydia (and Mrs Bennett’s) enthusiastic desire to go in Pride & Prejudice, and Lydia’s eventual elopement with Wickham and fall from grace. Overcrowding was a big issue. Often each house contained at least two families with an official health report revealing 96 families were dwelling in 40 houses visited. There was no sewage system or drains anywhere with cesspits being employed to take all the waste. House building for the poor stretched outwards from the water-cut valleys or bournes and up in terraces towards the downs. The cesspits, of course, allowed seepage through the chalk outwards and downwards. A nightmarish thought, but inevitably fever in Brighton was a way of life, and death. We know Jane and her party spent some time in Brighton; it would have been odd if they had not, but what they did there is shrouded in mystery for me at least. Many have said this before, but only a visit really gets across just how much of an assault on the visual senses Brighton Pavilion is; especially, the unique interior. It’s typical of European arrogance of the time, however, to design almost everything based on Chinese art and culture but with only Chinese artefacts to go from. None of the artists, builders and creators had actually been to the Far East, let alone were oriental! We had a wonderful tour with a very well-informed guide and I would not be alone in recommending everyone to visit. I am not sure who that is going in carrying the red bag, or even if they are from our party. We had lunch here (above] – and it seems somebody erected a pillar right in front of me just as I took the photo), and even if the outside is uninviting, the food and service were excellent and our table on the first floor offered a splendid view of the sea. Over an aperitif in the lounge Hil (Robinson) and I met a couple of jovial ladies wearing wonderful red hats with strange items and objects stuck in them. It turns out that there was more than one Literary Society in Brighton on that day. The Reverend Evans claims, “At a distance of three or four miles on the sea, Worthing appears to advantage; its new buildings glisten in the eye . . .“ After all the business with ‘half an anchor’ (as well as his claim that there is lots of sand on the 14 miles of beaches around Worthing even though there are many other sources backing both him and Fanny on their claims about golden sands), I’m beginning to have serious doubts about both the Reverend and his Guide. At that distance passengers in a boat, without powerful telescopes, when viewing Worthing would see no more than a distant smudge on the horizon, if indeed land was still in view. If he claims Worthing appears to advantage then this may be his idea of a ‘practical joke’ as if he did indeed not think much of Worthing after all. It could also be that he has no realistic notions about distances or the curvature of the earth. I reckon the latter, but I’ll leave you to judge for yourself. The picture [below], shows a few of the group boarding the bus for the north-west and home. 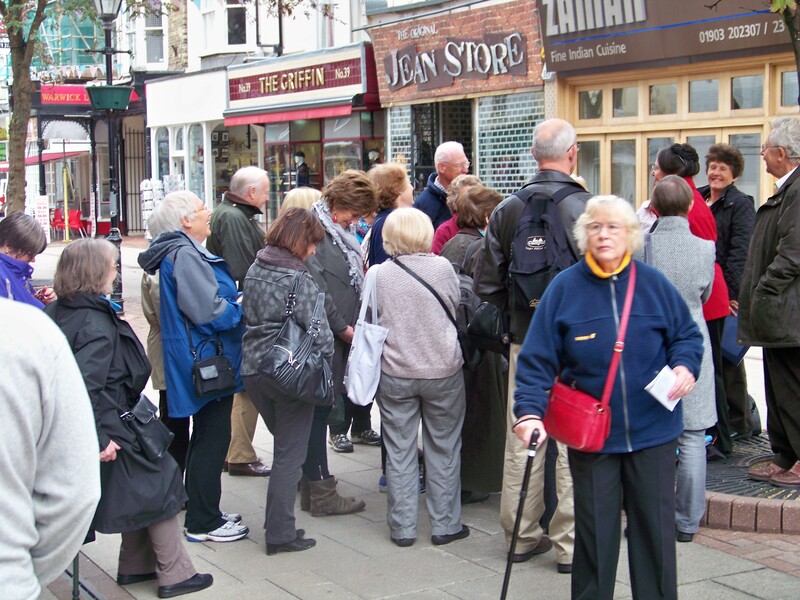 If some of them look less than sprightly it’s because we packed a lot into a wonderful weekend walking tour of Worthing and its surrounds. You can make out the exterior Pavilion Garden Wall to the left. 6. 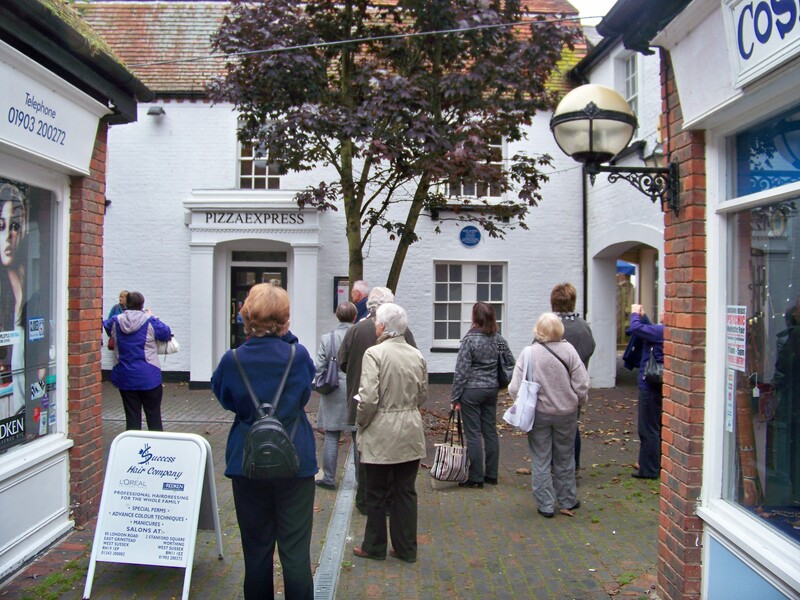 Jane Austen’s Worthing – A Local Guide, Janet Clarke, 2011, Verité CM Ltd. I am grateful for all Janet Clarke’s help and research. Answers to the ‘Cartoons’ in the Pizza Express (formerly Stanford’s Cottage): how well did you score? 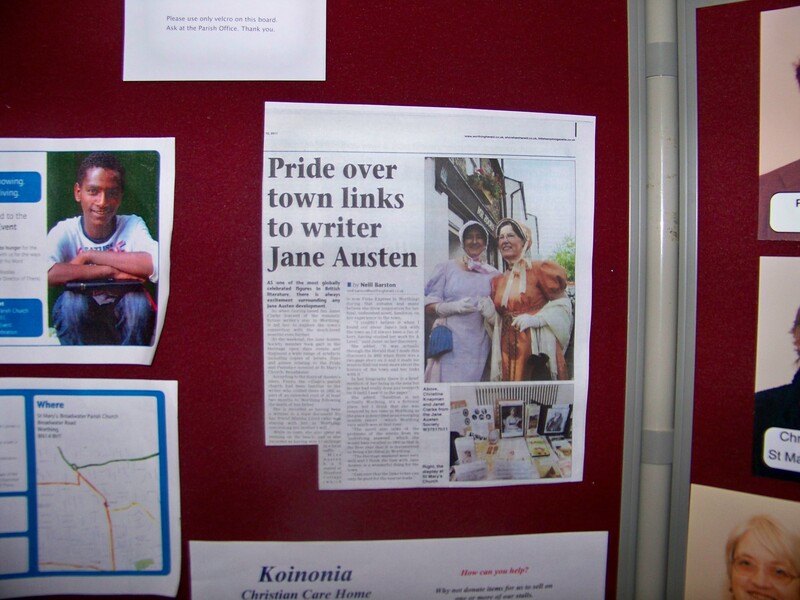 This entry was posted in Great Britain - History, Jane Austen, Jane Austen Societies and tagged British Red Hatters, Christopher Sandrawich, Jane Austen, Jane Austen Society - Midlands Branch, jas, Library Passage, Sanditon, Transactions, twitten, Worthing. Bookmark the permalink. Wonderful post. So detailed! Thank you for this armchair trip of Worthing! Thanks Vic! – we should ask Tony to take us on a tour together! I want to grab my passport & go traveling to all these wonderful places. Look what you have done!!!! Yes Mary – I too want to grab my passport and head over to Worthing – hopefully before these woeful changes are possibly initiated – glad you enjoyed Chris’s article – he is quite funny isn’t he?! Very good article Chrs with so much in it. Love your commentary as you travel around combining it with all the detailed history and insights. I have always thought Sanditon shows Jane Austen for the innovative and challenging writer she really was. Sanditon is a very incisive geographers analysis of a developing settlement but not only that, also a brand new type of settlement for the time. Jane is not actually getting into politics but definitely social change.And I think her main character Charlotte Heywood could have been her best character ever. She is intelligent and very strong. Maybe a dead ringer for Jane herself!!!! All the articles I write about Jane I get my information form Claire Tomlins autobiography, Jane,s leters edited by Deirdre le faye and of course her novels.I notice you have quoted from Fannies diary and i suspect most of your information for connecting jane to Worthing comes from Fanny. I must get a copy of that. The next time i drive past Chawton i will look in at the bookshop there. Surely must sell copies. Was it fannies disry that relates the inrterludes at Lyme? Again i have only the novels and Janes letters for Lyme. There is a hint in one of her letters about Tenby in Pembrokeshire. She mentions that two friends go there. 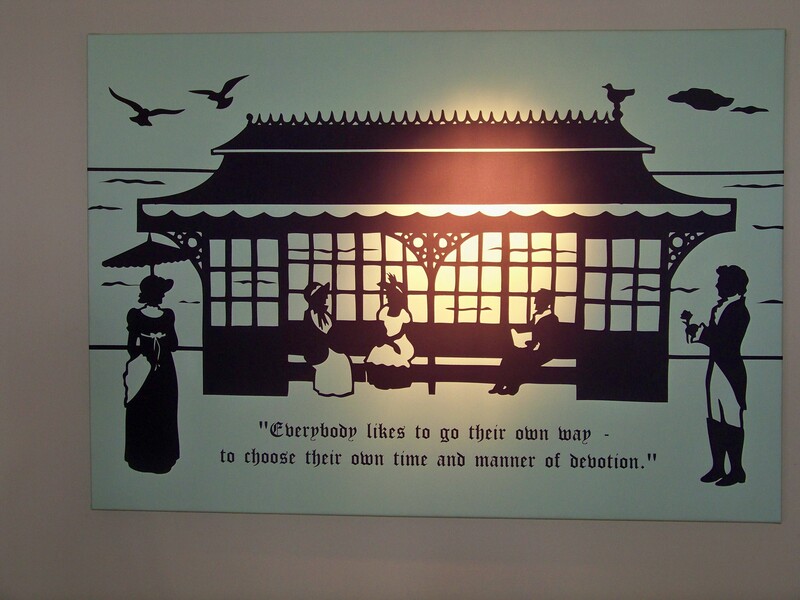 I went into the Castle Museum in Tenby the last time I was there and asked them about Austen. They seemed convinced she had stayed there. I would love to find the evidence. Anyway most enjoyable article. I learned a few things. I notice you didn’t get any pictures of the interior of The Pavilion in Brighton. Ha! Ha! Vic and Deb cancel your trip to New York we are going to Worthing!!! I’m sure that sounds like the line to a Beatles song???? NO it’s not!!!!!! !Just joking. As I wrote Vic, we shall hire you as guide! [we will not go so far as to cancel our AGM experience, but one does not have to preclude the other! – and yes, it does sound like a Beatles Song!] – and lovely to see that you are ever on the investigation to locate more places that she actually visited – nice to know there are still such tidbits to be discovered – maybe we might even find that she did go North?? – something to compete with the Brontes perhaps? Thanks for stopping by Tony! Thanks Tony. I have not read the whole of Fanny’s diary, just the parts relating to Worthing which I have pasted below for your interest, and any other readers. (It was thought that a visit to the seaside would improve Miss Sharpe’s eyesight. In the event, she gave up her post as governess the following year. We proceeded for Worthing at 9, spent 2 or 3 hours at Brighton & arrived there at 5. We walked on the sands in the evening. I went with G(rand)-mama in the morning to buy fish on the Beach, & afterwards with Mama & Miss Sharpe to Bathe where I had a most delicious dip. Mama & I ate some fish with Mr Fielding & Jefferson waited on the Sands for Aunt Cassandra coming out of the warm bath & then walked with Mama, Jane & the Johnsons in the morning, when I was walking with G(rand)-mama & again in the evening. We went to the Raffle in the evening. Miss Fielding dined with us, & we did not walk in the evening. I called on the Johnsons. Morning Church. Miss Lloyd, G(rand)-mama & Jane, went to Church, & I wrote (to) Henry. Papa, Mama, & I set off from Worthing to Hastings where we arrived about 8 after many difficulties. We could not get horses for a long time at Seaford & Southbourne. 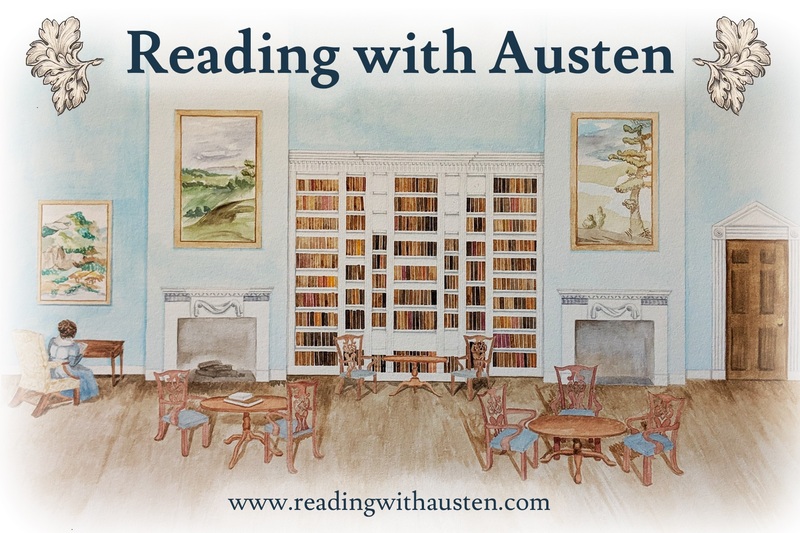 There is so much on Austen that even those of us who have shelves of Austen books and articles do not have ready access to – a few years in the Hampshire Records Office might be a good start – one does wonder what there might be discovered that even Ms. Le Faye has not yet come upon! Chris, this is amazing. Thank you so much.